It’s the end of the day on a wonderful Thanksgiving, and here you are stuck with a bowl stuffed full of mashed potatoes, a half eaten turkey, cranberries with yams, and a table still full of food. This year, though, you don’t have to worry about being stuck eating leftover Thanksgiving dinner for the next week. You can, not only, send your friends and neighbors home with their own leftover dinner, but you can also do it and impress your friends at the same time. 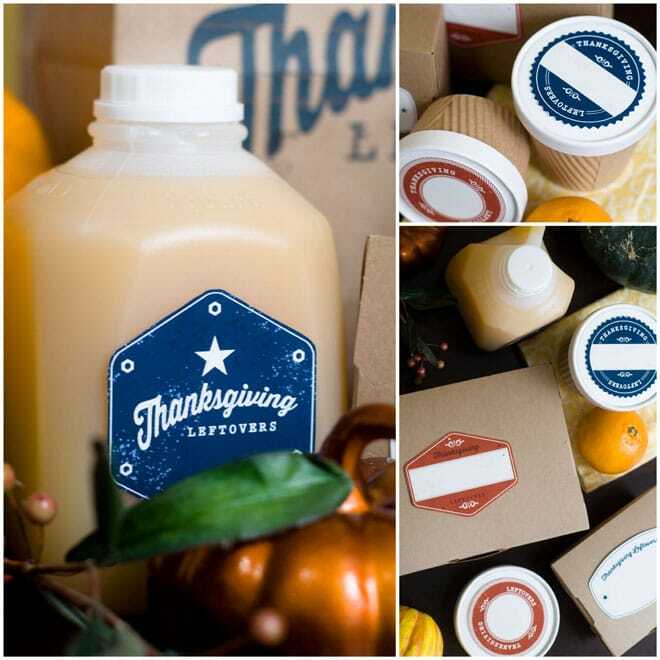 Easily print out (links below) and put together this kit of Thanksgiving Leftover containers to go! Then, let your friends fill up their containers, stuff their bag, and leave your house chatting about how organized and creative you are. Each of these labels also leave room for your friends to write down whether or not they have cranberry sauce or mashed potatoes in their container. What a great hostess you are! To put together the Thanksgiving Leftover kit, I used all the adorable packaging found at Garnish. To finish off the food packaging, don’t forget to download these vintage retro Thanksgiving leftover label free printables to cut out and put on your containers. One of my favorite parts of this whole project was finding these cute pint sized milk jugs to hold the leftover Thanksgiving punch. Wide format printer (one that prints at least 11 inches wide) – you can always visit your local office supply store! First, tape the edges of the kraft take out bag down, as well as tape the top together. Second, feed the bag top down, front up, in your printer. 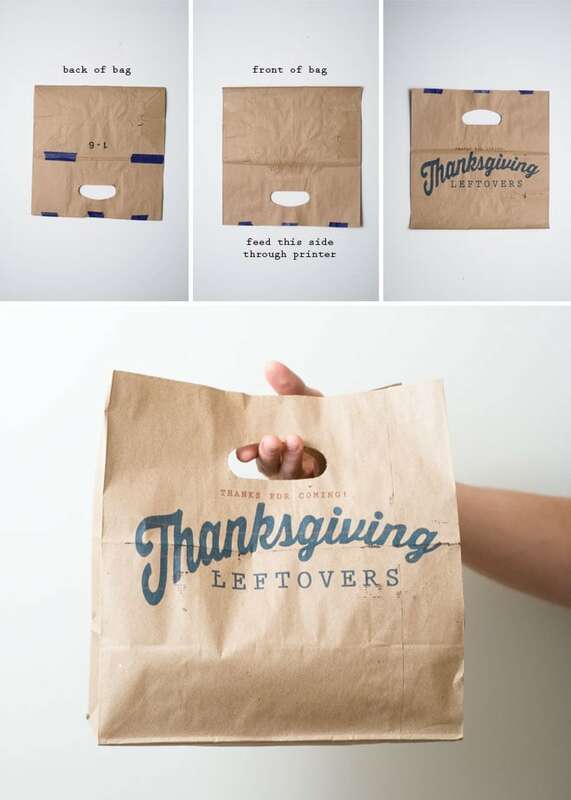 Third, print out the printable onto the bag. Tip: I had a little trouble feeding the bag through my printer. The key is to try and smooth out your kraft bag as flat as possible before feeding through your printer. Have a great Thanksgiving Day as well as the days after with these cute leftovers filling your, and your neighbors, fridges. Enjoy! Gobble Gobble! Cute Thanksgiving Party Inspiration! I don’t see the bag template?? Both links only lead me to the labels. :( would love to have it. Awesome idea by the way! I had the same problem. Both links lead me to the labels, but not the bag template, which I would love to use. Thanks for sharing! Sorry about that! Pregnancy has my brain all over the place :) All fixed! Where can I find the kraft bags? If the bag doesn’t fit I may use construction paper then glue to bag. I am obsessed with the idea of printed paper bags! I can’t wait to try it at our holiday gatherings. 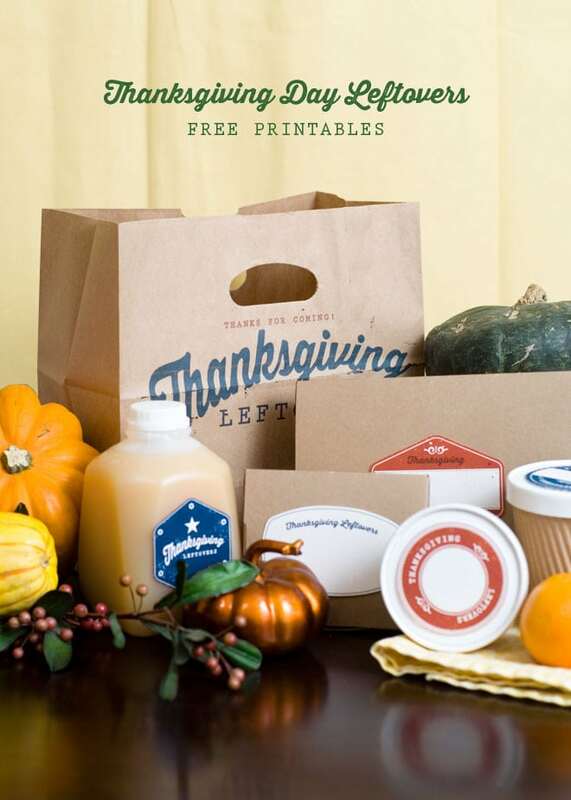 I included your great printables in a roundup of Thanksgiving freebies on my blog. Thanks so much for sharing! Thank you for sharing this free printable. I will be featuring this in my next post. Thank you for sharing this free printable.